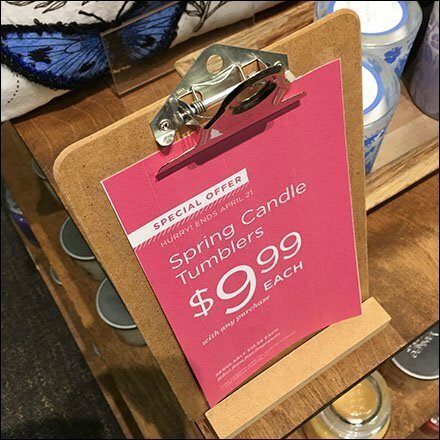 This reversed (white type knocked out of pink background) Candle Tumblers Hallmark Special Offer stands out among other in-store Clipboard offers. Particularly attractive offers were reversed like this to differentiate from “informative” Clipboards. The greater use of color was more attention compelling. See that Clipboard Holder is a separate fixture, though Clipboards alone easily hang, lay on surfaces, or lean.